I suspect that for many of you the name Numitron is new, while for many others it will bring back (hopefully fond) memories. 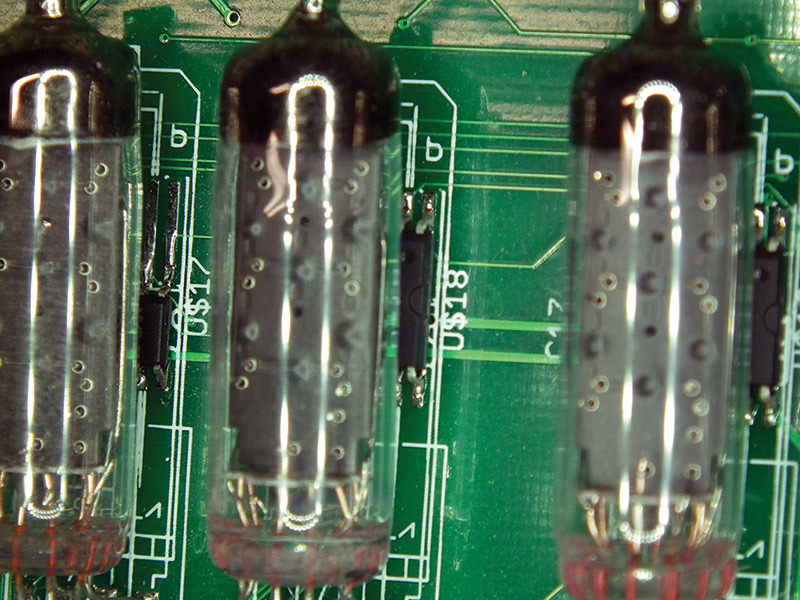 The venerable electron tube (a.k.a., thermionic valve) has all but disappeared from the mainstream electronics world, and along with them related old technologies such as the Nixie tube (featured in previous N&V articles), Dekatrons, Numitrons, and Panaplex displays, and (to a lesser extent) Vacuum Fluorescent Displays (VFDs) have also faded into the background. FIGURE 1. 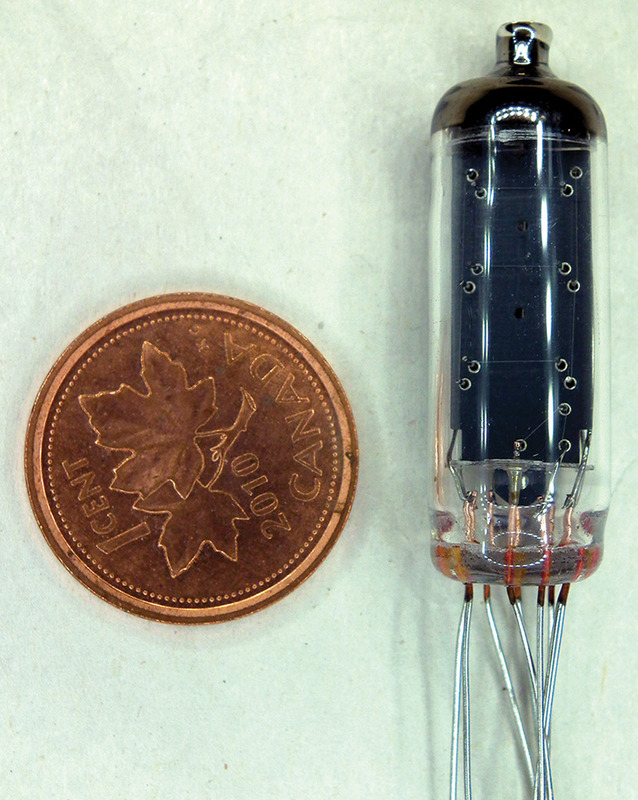 A Numitron tube (with a penny for scale) ready to install. The manufacture of the first Numitron was — according to Wikipedia (https://en.wikipedia.org/wiki/ Seven-segment_display) as well as a March 1970 Popular Electronics article (www.rfcafe.com/references/popular-electronics/numitron-readout-march-1970-popular-electronics.htm) — attributed to RCA. It was built based on the common seven-segment display format first patented in 1908 by someone called F.W. Wood. Around the same time the Numitron was created, LEDs were also up and rising, and quickly posed a significant competitor. The Numitron is still a vacuum tube, and the wires of the IV-9 pass via a sealed hole through the glass envelope. Great care must be taken to ensure no stress (from bending or soldering) is transferred to the glass, which may cause it to crack. The Numitron is not a traditional tube (valve) in that there is no electron emission involved; it only has filaments, and as such is more analogous to the light bulb than any other electrical device. 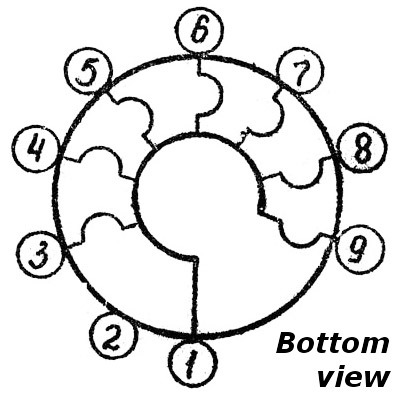 Seven small filaments (Figure 2a) are arranged in the traditional formation of the seven-segment LED numerical display we are all familiar with (Figure 2b), all within a simple glass tube. FIGURE 2a. 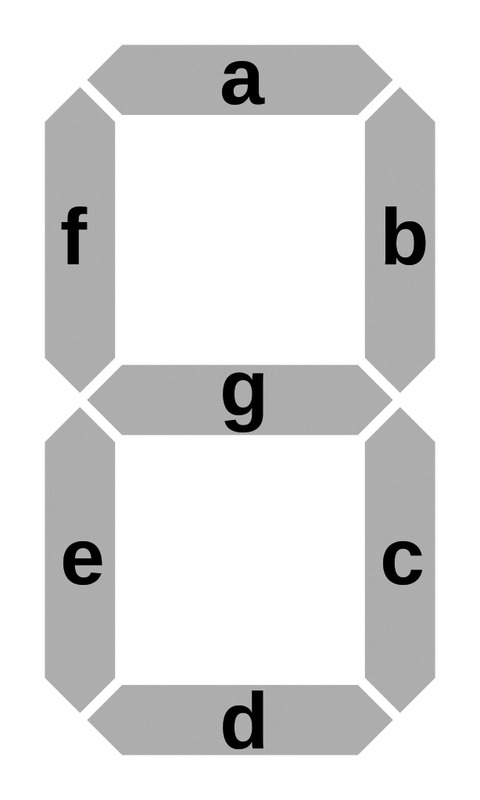 A typical seven-segment display layout uses letters to identify each individual lighted part of the display. FIGURE 2b. The pinout of a Numitron tube. Note that since the Numitron uses filaments, the common can be positive, negative, or even power via AC voltage. The particular Numitron used in this project (the IV-9) operates on five volts at about 23 mA per segment. It has “fly leads” and as such does not require a difficult socket (Figure 3). FIGURE 3. The Numitron tube mounts directly to the PCB without the need for a socket. FIGURE 4. Close-up of placing one of the 0805 caps on the board. The “brains” of the project is a Microchip PIC, and it is a very busy fellow in this project; it’s in control of everything happening on the board. LEDs lend themselves very well to multiplexing, and that is used extensively to control the 60 LEDs that form the circle around the Numitrons. They display eight different programmed patterns, most based on a one minute repeat cycle. FIGURE 5. The PICkit3 connected to the Numitron board for programming. FIGURE 6. 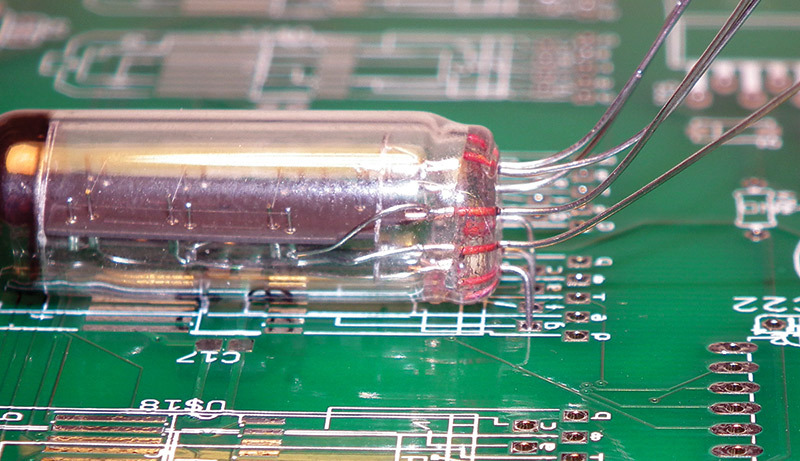 The clock timing crystal installed on the PCB with the surface-mount noise decoupling capacitors. FIGURE 7. Schematic of the power supply section of the project. Though I considered a linear regulator, the part became hotter than I was comfortable with while testing in a circuit like this. Additionally, a switch mode supply allows for more choices when it comes to wall wart style power supplies (Figure 8). The greatest current requirement is during the start-up flash cycle, where all six Numitrons are lit for a second at the time; 7x6 segments at about 23 mA = 966 mA total. Maximum current required for the project peaks therefore very close to the one amp limit when all Numitron segments are lit when first plugged in (or after reset). FIGURE 8. 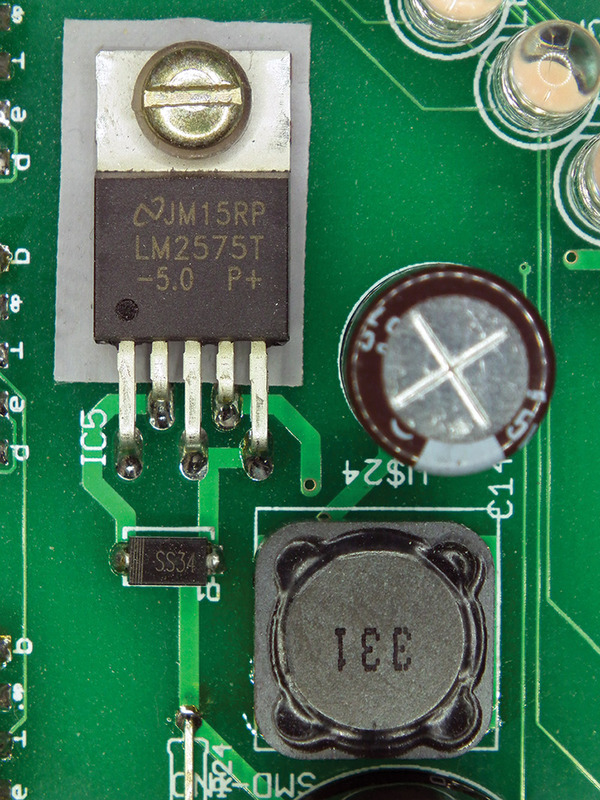 Close-up of the LM2575T regulator installed on the PCB. The LEDs are multiplexed in seven rows of eight, with one additional short row of four for a total of 60. The PIC drives one row at a time, and at a couple of mA each, the current draw is well within the specifications for the PIC. By using one byte per row, there are never more than eight LEDs lit at any given time (Figure 9). The circle will appear to be fully lit when required, thanks to a fast multiplex rate and a phenomenon called ‘persistence of vision’ in our eyes. FIGURE 9. Schematic of the LED driver portion of the project. It is important to use high output (also referred to as ultra-bright) LEDs for this design since regular LEDs will appear too dim. You may choose any color you like; the slight difference in voltage requirement for the different colors is insignificant in this project, and does not require any further consideration. Since most of these high output LEDs are “water clear” units, placement is very important to provide a visually pleasing result (Figure 10). The construction manual at the article link provides tips for proper installation and alignment. FIGURE 10. 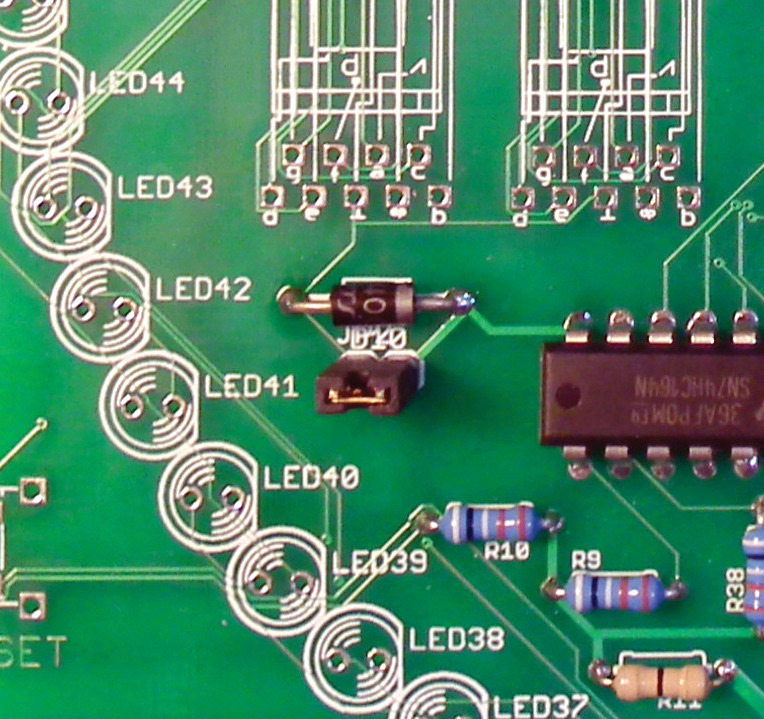 Close-up of the top of the PCB showing the water-clear LEDs in place. 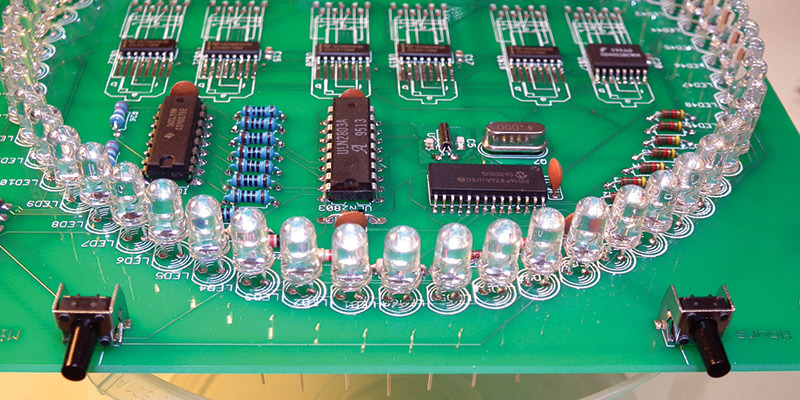 While a PIC pin will only need to drive a single LED at any given time, the combined current of the full row may need to be sunk in order to light all eight in that row since this exceeds the current output capacity of the CD4017. The ULN2803 acts as the driver there. Also, we need a way to select the correct row synchronized with the data sent from the PIC port. This is the task of the CD4017 decade counter. The Numitrons are essentially just little multi-filament incandescent light bulbs from an electrical perspective, and as such, multiplexing them will simply act as a light dimmer. A 1x6 (or even a 2x3) multiplexing arrangement would leave them very dim, so is not a viable option. Luckily — since their current requirement at about 23 mA per segment is fairly low and it is a seven-segment device operating at about five volts — we can drive them with a standard BCD to seven-segment decoder designed for seven-segment LED displays with a max driving output of 25 mA. The CD4511 also has a data latch built in, so it was chosen for this design. I opted for the SMD version since they neatly tucked behind the Numitron tube, making for a nice clean appearance (Figures 11a and 11b). FIGURE 11A. 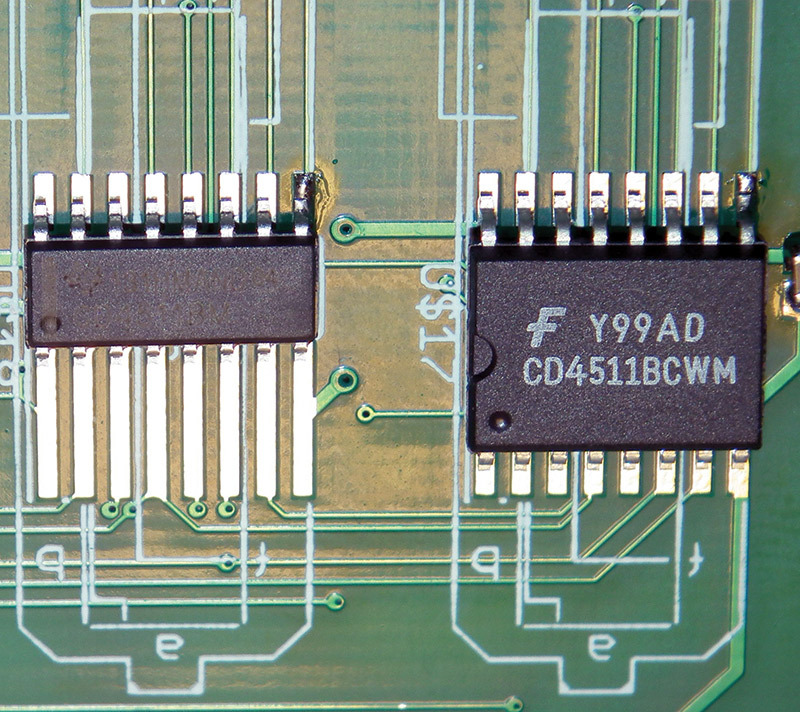 Close-up of the surface-mount CD4511 BCD to seven-segment display decoder. FIGURE 11B. Numitron tube mounted snugly atop the surface-mount CD4511 chip. Since I am now rapidly running out of ports on the PIC, I needed an efficient way to control the CD4511s and their latches. This is done by the 74164 shift register in a similar fashion as to how the CD4017 operates in the LED section. 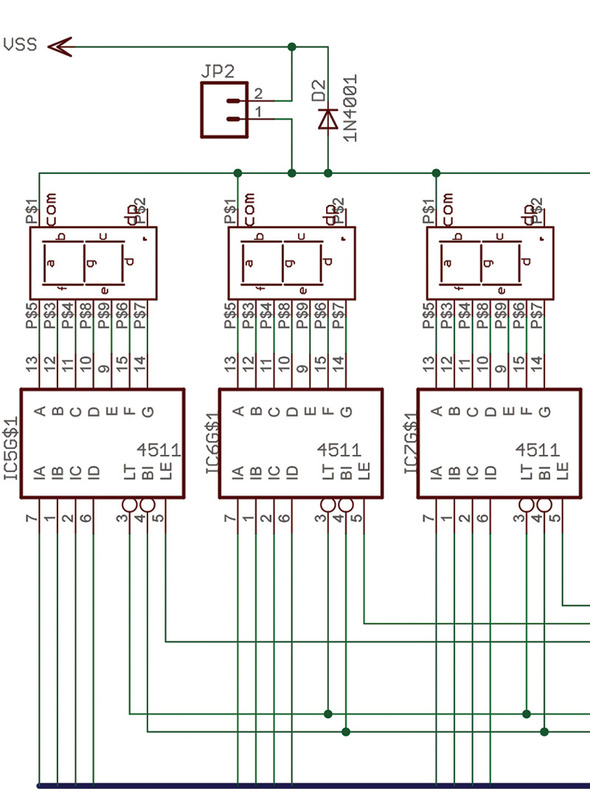 The BCD data is presented to all the CD4511s at the same time via the data bus, but decoded and latched only by the CD4511 selected by the SN74HC164 shift register. Synchronization of data and latch selection is controlled in software. Since the time only changes every second, only one Numitron digit is updated for each time the LED circle is updated. This made the software easier, and it is still much faster than actually required. The CD4511 also has a “lamp test” function which is used to flash all segments during startup and for reset of the clock, also providing an easy way to test the Numitrons. Note also the diode D2 and jumper JP2 (Figure 12a). They were intended to be a rudimentary option for lowering the brightness of the Numitrons and lower the current requirement slightly. It simply relied on the forward voltage drop of the diode, with a jumper to short it (Figure 12b). It is not really required and may be left off the board, in which case a simple jumper wire may be inserted in place of the diode. FIGURE 12A. Location of the diode and jumper JP2 on the PCB. FIGURE 12B. Schematic showing the location of the jumper and voltage dropping diode. The clock is set using only two buttons with multiple functions to control 12/24 hour display selection, LED pattern selection, as well as setting the time. 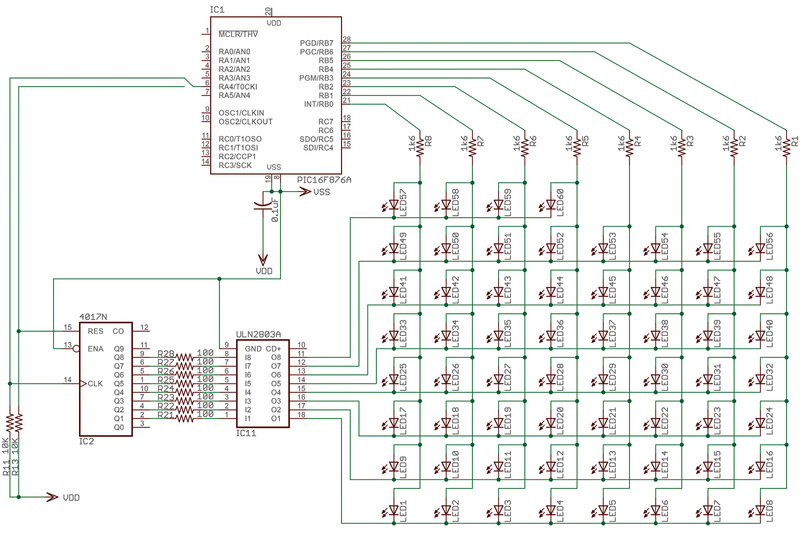 Buttons (or switches) are difficult things to read in high speed digital circuits since the mechanical parts in a switch or button actually bounce like a dropped ball; it takes a bit of time to stop settling in one state or the other when pushed. Debouncing can be done in software, but in this case, a hardware solution was used. 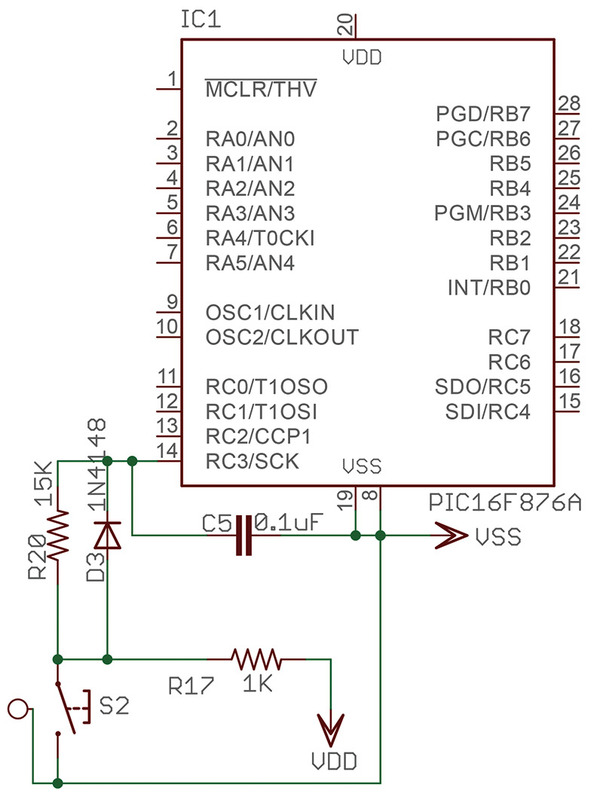 The solution is based on the RC time required to charge/discharge a small capacitor (Figure 13). FIGURE 13. Schematic of the clock set pushbutton debounce circuit. When the button closes, the capacitor (C7) is discharged through a resistor (R19), allowing the bounce to settle before the voltage on the PIC input pin falls below the logic level 0. When released, the capacitor is charged quickly through R18 and D4. By using this method, no further precautions are required in the software, and the button is treated like an ideal button without bounce. A fantastic discussion on the subject is listed in Resources. The printed circuit board (PCB) is a standard two-layer version, and has no complicated manufacturing issues for most board houses. As mentioned, the Eagle files as well as Gerber (RS274x) files for those board houses that do not accept native Eagle files are at the article link. Of interest is the somewhat odd looking footprint for the CD4511s (Figure 14). FIGURE 14. 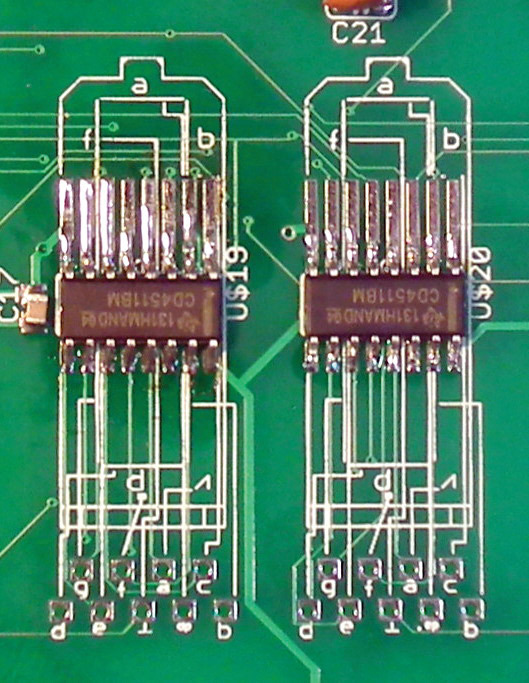 Example of a PCB that can accommodate both wide and narrow versions of the SMD chip. The circle of LEDs was created by specifying a set of vector coordinates in Eagle by specifying the center, radius, and angle for each LED. The board is about 6” square, and has four mounting holes in which stand-offs are used to hold the front and rear Plexiglas or acrylic panels which allows the finished product to stand vertical. A free version of Eagle CAD can be downloaded from the link in Resources. Timer 2 has a special register (PR2) that allows the timer period to be changed on-the-fly; the timing values required for each step are stored in lookup tables. The positions of the dot are also stored in a lookup table. Setting preferences (12/24 mode and preferred LED pattern) are stored in the PIC’s internal EEPROM, and are therefore not lost on reset or power failure. Building this project is probably at an advanced skill level, mostly due to the number of surface-mount parts. 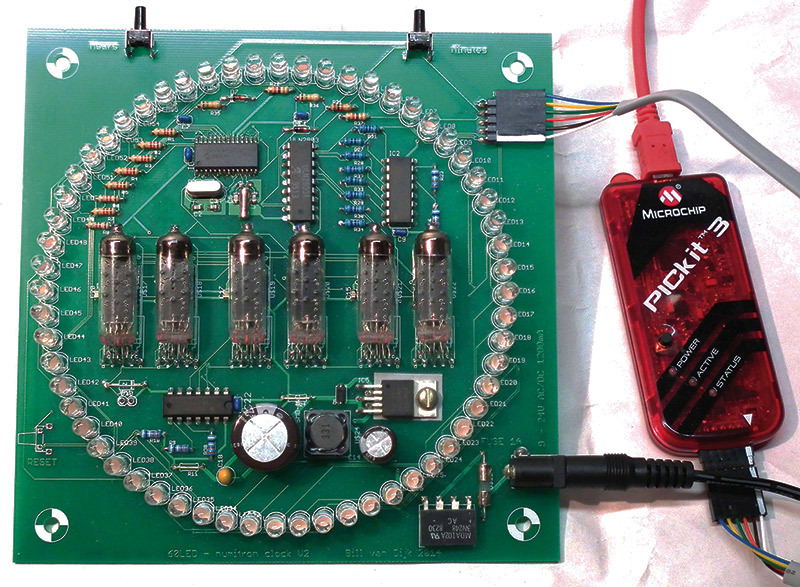 Even if you don’t intend to build this clock, you may enjoy reading the construction manual since it contains many tips and examples that may be of use to you in this or other projects. None of the SMDs used here are ridiculously difficult to solder by hand, but it does require a steady hand, good light, a magnifying glass, and a good soldering iron. Small components are best soldered with small tools. That means a very fine soldering tip, fine point tweezers, and very thin solder. 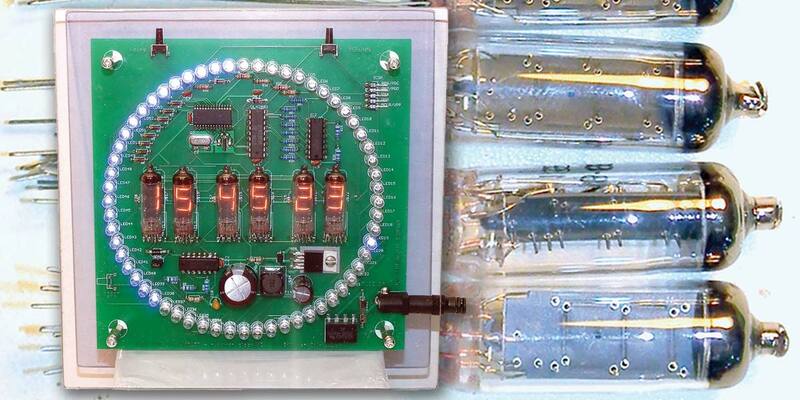 The SMD components in this project are not very difficult to solder, however, I'll describe the methods I use. Caps, resistors, etc., come in many sizes; 0805 (used in this project) and larger can easily be soldered as follows: Start with placing a small drop of solder on ONE pad. With the tweezers, place the part on the pad, heat the drop, and push the part in place (refer to Figure 10b in the text). If the part is not located properly, reheat the one side and correct. Once properly placed, solder the other side. A similar method is used for the ICs. Place solder on ONE pad, and place the part. If not located correctly, reheat and reposition. Do NOT push to bend the leg even a little bit. The legs will break easily, and the stress will add to future failure chances (Figure 13a). Please see the construction manual at the article link for more in-depth information. My Weller soldering station has replaceable tips, and the tip I use for the SMD parts is almost needle sharp. 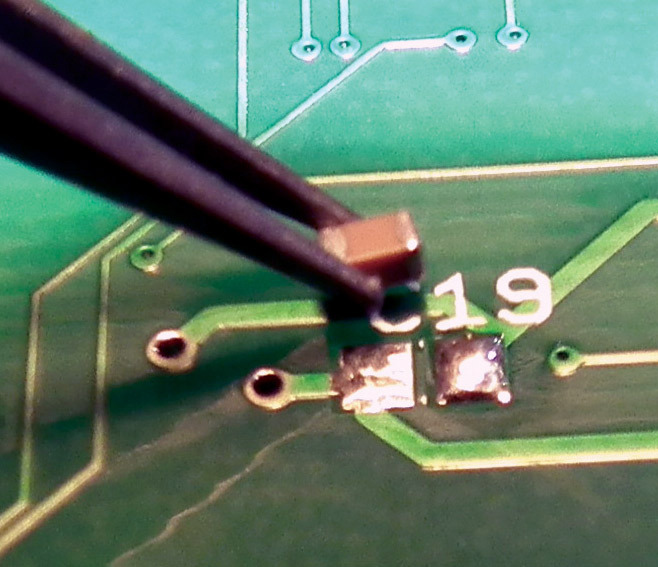 Combined with very thin solder (0.020”), it is really not too hard to do (Figure 15). I have included additional tips in the construction manual at the article link. When ordering the SMD capacitors, order a few spares. 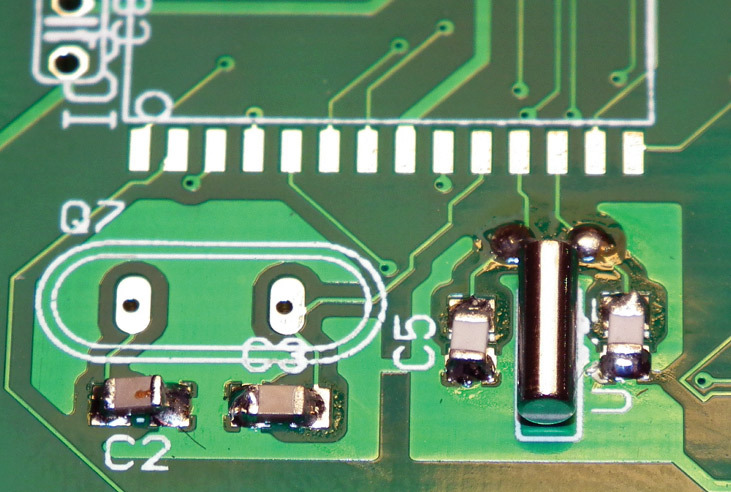 If you lose an SMD capacitor during construction, look at the end of your soldering iron first. If it’s not there, best go get another one. FIGURE 15. 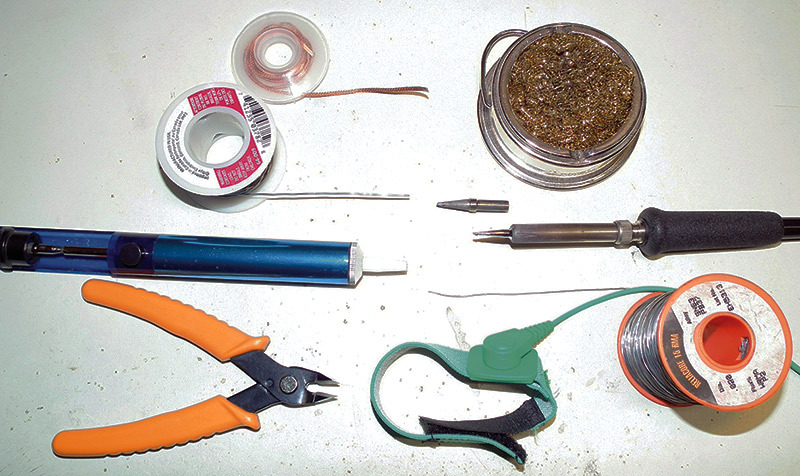 The tools I use for surface-mount components on PCBs. I usually buy things like the small SMD parts in kits from online providers; it provides lots of spares that way. Speaking of online providers, eBay is a good source for inexpensive parts if you are not in a rush. Since you will probably get your Numitrons there (Figure 16), other parts can be ordered at the same time. FIGURE 16. Typical set of Numitron tubes available on eBay. LEDs can be found on eBay for very cheap, but it’s definitely “buyer beware” in my experience; many are junk. Don’t buy the “1,000 for a dollar” deal because you will be disappointed. I have included Mouser part numbers for many of the components if you prefer not to take chances. Of course, there are many other excellent vendors to choose from as well (check the advertisers in this issue!). Another important thing to keep in mind is static protection — especially in the winter when houses become dry, and static discharges (even so small that you can’t feel them) are guaranteed to destroy or damage many of the parts in this project. They do not suffer from failure states such as “sputtering” where electrode metal collects on the inside of the glass tube dimming or obscuring the display. They don’t encounter cathode poisoning that requires a potentially distracting anti-cathode poisoning software routine. 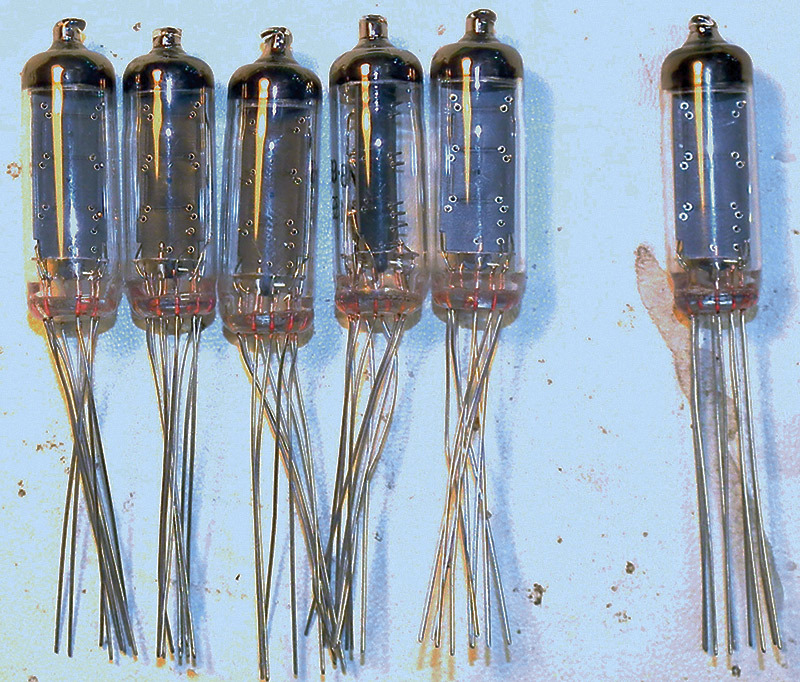 In many cases, Numitrons will outlast Nixie tubes as they are typically rated for over 100,000 hours (~11.5 years) of operation compared to some Nixies that are rated for only 5,000 hours (~200 days!). All in all, Numitrons are a fun and interesting item, and having them used in a clock while surrounded by high tech LEDs makes for a great conversation piece! I highly recommend Numitrons even if you already have a nifty Nixie clock. Parts denoted with * are specifically mentioned in the text. Please read before ordering.